^ 杨立杰. 共产主义小组的建立与中国共产党的成立. 新华网. [2015年6月1日]. （原始内容存档于2013年4月30日） （中文（简体）‎）. ^ 2.0 2.1 2.2 2017年中国共产党党内统计公报 页面存档备份，存于互联网档案馆.人民网. ^ 《解放軍報》. 为建设一支听党指挥能打胜仗作风优良的人民军队而奋斗. 新華網. 2013年1月1日 [2015年6月1日]. （原始内容存档于2013-09-27） （中文（简体）‎）. ^ 杨婷. 在实现中国梦征途上昂扬奋进——以习近平同志为总书记的党中央十八大以来治国理政纪实. 新華網. 2014年1月9日 [2015年6月1日]. （原始内容存档于2015-07-02） （中文（简体）‎）. ^ 中国共产党. 新華網. [2015年6月1日]. （原始内容存档于2015年8月10日） （中文（简体）‎）. ^ 7.0 7.1 7.2 新華網. “中国共产党”名称的由来. 中国共产党新闻网. [2016年8月20日]. （原始内容存档于2016-11-29） （中文（简体）‎）. ^ 姚笛. 瞿秋白：译词传谱国际歌. 光明网. 2008年1月28日 [2015年6月29日]. （原始内容存档于2016-03-04） （中文（简体）‎）. ^ 9.0 9.1 9.2 9.3 9.4 Liang Jun和Yao Chun. 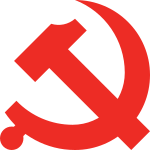 Flag and emblem of Communist Party of China. 中國共產黨新聞網. 2013年3月29日 [2015年6月1日]. （原始内容存档于2015-03-27） （英语）. ^ 12.0 12.1 Mo Hong'e. History of the Communist Party of China. 新華網. 2011年4月29日 [2015年6月1日]. （原始内容存档于2015-03-29） （英语）. ^ 少华. “一大”主席为何非李大钊或陈独秀 而是张国焘？. 鳳凰網. 2010年9月21日 [2015年6月1日]. （原始内容存档于2014-10-22） （中文（简体）‎）. ^ 15.0 15.1 方德萬. From Friend to Comrade: The Founding of the Chinese Communist Party, 1920-1927. 美國奧克蘭: 加利福尼亞大學出版社. 1992年2月26日: 第27頁 [2015年6月1日]. ISBN 978-0520072718 （英语）. ^ 方德萬. From Friend to Comrade: The Founding of the Chinese Communist Party, 1920-1927. 美國奧克蘭: 加利福尼亞大學出版社. 1992年2月26日: 第44頁 [2015年6月1日]. ISBN 978-0520072718 （英语）. ^ 19.0 19.1 19.2 19.3 James Z. Gao. Historical Dictionary of Modern China (1800-1949). 美國拉納姆: 羅曼和利特爾菲爾德出版集團公司（英语：Rowman & Littlefield）. 2009年6月16日: 第119頁 [2015年6月1日]. ISBN 978-0810849303 （英语）. ^ 22.0 22.1 徐元宫. 中共诞生初期共产国际发经费用鸦片代替珠宝现钞. 鳳凰網. 2011年4月13日 [2015年6月1日]. （原始内容存档于2014-10-30） （中文（简体）‎）. ^ 第三國際. 共产国际执行委员会关于中国革命目前形势的决定. 新華網. 1927年7月 [2015年6月1日]. （原始内容存档于2008年8月26日） （中文（简体）‎）. ^ 孙国林. 中国共产党历史上的两个“临时中央”始末（下）. 中國共產黨新聞網. [2015年6月1日]. （原始内容存档于2016-03-04） （中文（简体）‎）. ^ 杨奎松. 中国近代通史第八卷：内战与危机1927-1937. 南京: 江苏人民出版社. 2013: 122. ISBN 978-7-214-08098-1 （中文（简体）‎）. ^ 张发奎口述;夏莲瑛访谈及记录;胡志伟翻译及校注. 张发奎口述自传：国民党陆军总司令回忆录. 北京: 当代中国出版社. 2012: 109. ISBN 978-7-5154-0121-8 （中文（简体）‎）. ^ 叶子. 陈独秀因反对“武装保卫苏联”被开除出党. 中國網. 2007年9月20日 [2015年6月1日]. （原始内容存档于2015-09-23） （中文（简体）‎）. ^ 《黨史文苑》. 中共历史上的三个“三人团”. 鳳凰網. 2007年12月16日 [2015年6月1日]. （原始内容存档于2015-11-21） （中文（简体）‎）. ^ 程中原. 张闻天传. 北京: 当代中国出版社. 2006: 131. ISBN 978-7-80092-927-4. ^ 郭廷以. 近代中國史綱. 上海人民出版社、格致出版社. 2012: 435. ISBN 978-7-5432-2049-2 （中文（简体）‎）. ^ 中共中央文献编辑委员会编辑. 周恩来选集（上）. 北京: 人民出版社. 1984: 70–71. ^ 郭廷以. 近代中國史綱. 上海人民出版社、格致出版社. 2012: 478. ISBN 978-7-5432-2049-2 （中文（简体）‎）. ^ 张德祥. 现实主义当代流变史. 社会科学文献出版社. 1997年: 121–123. ISBN 978-7-80050-911-7 （中文（简体）‎）. ^ 中共中央党史研究室. 中国共产党历史：第二卷（1949-1978） 下. 北京: 中共党史出版社. 2011: 551. ISBN 978-7-5098-0950-1 （中文（简体）‎）. ^ 61.0 61.1 Wong Yiu-Chung. From Deng Xiaoping to Jiang Zemin: Two Decades of Political Reform in the People's Republic of China. 美國拉納姆: 美洲大學出版社（英语：University Press of America）. 2005年2月22日: 第47頁 [2015年6月1日]. ISBN 978-0761830740 （英语）. ^ Lawrence R. Sullivan. Historical Dictionary of the Chinese Communist Party. 美國拉納姆: 羅曼和利特爾菲爾德出版集團公司（英语：Rowman & Littlefield）. 2011年11月4日: 第254頁 [2015年6月1日]. ISBN 978-0810872257 （英语）. ^ 63.0 63.1 鄧小平. 邓小平：建设有中国特色的社会主义. 人民網. 1984年6月30日 [2015年6月1日]. （原始内容存档于2015-09-24） （中文（简体）‎）. ^ 杨继绳. 1978年，历时36天的中央工作会议. 新華網. 2008年2月28日 [2015年6月1日]. （原始内容存档于2014-09-07） （中文（简体）‎）. ^ 官方为何从不提中越战争：一场毫无意义的战争. 戰略網. 2015年1月12日 [2015年6月1日]. （原始内容存档于2015-06-04） （中文（简体）‎）. ^ 中共中央通过《关于建国以来党的若干历史问题的决议》. 新華網. 2003年1月20日 [2015年6月1日]. （原始内容存档于2015年8月10日） （中文（简体）‎）. ^ 王梅和张彦台. 中央顾问委员会：特定历史时期的独特选择. 中國共產黨新聞網. [2015年6月1日]. （原始内容存档于2016-03-04） （中文（简体）‎）. ^ Lawrence R. Sullivan. Historical Dictionary of the Chinese Communist Party. 美國拉納姆: 羅曼和利特爾菲爾德出版集團公司（英语：Rowman & Littlefield）. 2011年11月4日: 第25頁 [2015年6月1日]. ISBN 978-0810872257 （英语）. ^ 盛平编. 胡耀邦思想年譜. 泰德时代出版有限公司. 2007: 1313–1314. ISBN 978-988-98755-7-2 （中文（简体）‎）. ^ Tiananmen Square protests of 1989. Economic Expert. [2013年12月28日]. （原始内容存档于2014年7月14日） （英语）. ^ 《人民日報》. 必須旗幟鮮明地反對動亂. 中國共產黨新聞網. 1989年4月26日 [2015年6月1日]. （原始内容存档于2014-10-06） （中文（繁體）‎）. ^ 高航. 历程：奉命执行北京市部分地区戒严任务. 新華網. 2005年7月31日 [2015年6月1日]. （原始内容存档于2015-08-23） （中文（简体）‎）. ^ 張良. 中國「六四」真相──June Fourth: The True Story（第913頁）. 六四檔案. 2001年4月15日 [2013年12月28日]. （原始内容存档于2013-06-21） （中文（简体）‎）. ^ 谷玥. 中国共产党第十三届中央委员会历次全体会议. 新華網. [2015年6月1日]. （原始内容存档于2016年3月4日） （中文（简体）‎）. ^ 79.0 79.1 Lawrence R. Sullivan. Historical Dictionary of the Chinese Communist Party. 美國拉納姆: 羅曼和利特爾菲爾德出版集團公司（英语：Rowman & Littlefield）. 2011年11月4日: 第238頁 [2015年6月1日]. ISBN 978-0810872257 （英语）. ^ 杨立杰. 中国共产党第十六届中央委员会历次全体会议（中共中央全会）. 新華網. [2015年6月1日]. （原始内容存档于2013年2月7日） （中文（简体）‎）. ^ 81.0 81.1 Lawrence R. Sullivan. Historical Dictionary of the Chinese Communist Party. 美國拉納姆: 羅曼和利特爾菲爾德出版集團公司（英语：Rowman & Littlefield）. 2011年11月4日: 第317頁 [2015年6月1日]. ISBN 978-0810872257 （英语）. ^ 中國共產黨第十七次全國代表大會. 十七大关于《中国共产党章程（修正案）》的决议. 新華網. 2007年10月21日 [2015年6月1日]. （原始内容存档于2015-08-06） （中文（简体）‎）. ^ 中国共产党第十八次全国代表大会关于《中国共产党章程（修正案）》的决议. 新華網. 2012年11月24日 [2015年6月1日]. （原始内容存档于2015-10-10） （中文（简体）‎）. ^ 杨立杰. 中共中央历任主要负责人. 新華網. [2015年6月1日]. （原始内容存档于2011年10月4日） （中文（简体）‎）. ^ Hu Jintao, Xi Jinping meet delegates to 18th CPC National Congress. 新華網. 2012年11月16日 [2015年6月1日]. （原始内容存档于2015-09-29） （英语）. ^ Xi who must be obeyed. 《經濟學人》. 2014年9月20日 [2015年6月1日]. （原始内容存档于2015-05-16） （英语）. ^ 中国共产党第十九次全国代表大会举行闭幕会 习近平主持闭幕会. 中央纪委监察部网站. [2017年10月24日]. （原始内容存档于2017-10-24）. ^ 关于共产党在无产阶级革命中的作用. 少年中国评论. [2015年6月1日]. （原始内容存档于2016-03-04） （中文（简体）‎）. ^ 人民網. 1958年6月10日 中央发出《关于成立财经、政法、外事、科学、文教小组的通知》. 中國共產黨新聞網. [2015年6月1日]. （原始内容存档于2016-03-04） （中文（简体）‎）. ^ 高雷. 党的基层组织建设全面推进：设置不断优化，覆盖不断扩大. 中國共產黨新聞網. 2010年6月28日 [2015年6月1日]. （原始内容存档于2016-03-04） （中文（简体）‎）. ^ 赵娟. 中共中央关于建立党组、党委问题的补充通知. 中國共產黨新聞網. 1978年4月5日 [2015年6月1日]. （原始内容存档于2014-11-03） （中文（简体）‎）. ^ 95.0 95.1 95.2 95.3 95.4 95.5 中国共产党领导的多党合作和政治协商制度. 中國網. [2015年6月1日]. （原始内容存档于2015-05-11） （中文（简体）‎）. ^ 96.0 96.1 Colin Mackerras、Donald H. McMillen和Andrew Watson. Dictionary of the Politics of the People's Republic of China. 英國倫敦: 羅德里奇. 2001年1月27日: 第70頁 [2015年6月1日]. ISBN 978-0415250672 （英语）. ^ 97.0 97.1 97.2 97.3 97.4 97.5 97.6 97.7 王传志. 民主集中制： 我国政治制度的核心机制. 《求是》. 2013年5月16日 [2015年6月1日]. （原始内容存档于2014-11-21） （中文（简体）‎）. ^ 98.0 98.1 98.2 98.3 乔纳森·安格（英语：Jonathan Unger）. The Nature of Chinese Politics: From Mao to Jiang. 美國阿蒙克: M·E·夏普出版公司（英语：M. E. Sharpe）. 2002年6月: 第22頁 [2015年6月1日]. ISBN 978-0765608482 （英语）. ^ Thomas A. Baylis. Governing by Committee: Collegial Leadership in Advanced Societies. 美國奧巴尼: 紐約州立大學出版社（英语：State University of New York Press）. 1989年6月: 第102頁 [2015年6月1日]. ISBN 978-0887069444 （英语）. ^ 乔纳森·安格（英语：Jonathan Unger）. The Nature of Chinese Politics: From Mao to Jiang. 美國阿蒙克: M·E·夏普出版公司（英语：M. E. Sharpe）. 2002年6月: 第22頁至第24頁 [2015年6月1日]. ISBN 978-0765608482 （英语）. ^ 101.0 101.1 101.2 乔纳森·安格（英语：Jonathan Unger）. The Nature of Chinese Politics: From Mao to Jiang. 美國阿蒙克: M·E·夏普出版公司（英语：M. E. Sharpe）. 2002年6月: 第158頁 [2015年6月1日]. ISBN 978-0765608482 （英语）. ^ 中国共产党第十八届中央委员会第六次全体会议公报. 新华网. 2016年10月27日 [2018年4月25日]. （原始内容存档于2018-07-08）. ^ 中國共產黨新聞網. 第十八届中共中央组织结构图. 人民網. [2015年6月1日]. （原始内容存档于2015-08-13） （中文（简体）‎）. ^ 105.0 105.1 Colin Mackerras、Donald H. McMillen和Andrew Watson. Dictionary of the Politics of the People's Republic of China. 英國倫敦: 羅德里奇. 2001年1月27日: 第228頁 [2015年6月1日]. ISBN 978-0415250672 （英语）. ^ 106.0 106.1 Colin Mackerras、Donald H. McMillen和Andrew Watson. Dictionary of the Politics of the People's Republic of China. 英國倫敦: 羅德里奇. 2001年1月27日: 第229頁 [2015年6月1日]. ISBN 978-0415250672 （英语）. ^ Colin Mackerras、Donald H. McMillen和Andrew Watson. Dictionary of the Politics of the People's Republic of China. 英國倫敦: 羅德里奇. 2001年1月27日: 第66頁 [2015年6月1日]. ISBN 978-0415250672 （英语）. ^ 109.0 109.1 William A. Joseph. Politics in China: An Introduction. 英國牛津: 牛津大學出版社. 2010年4月23日: 第394頁 [2015年6月1日]. ISBN 978-0195335309 （英语）. ^ 110.0 110.1 Guoli Liu. Politics and Government in China. 美國聖塔芭芭拉: ABC-CLIO（英语：ABC-CLIO）. 2011年7月22日: 第394頁 [2015年6月1日]. ISBN 978-0313357305 （英语）. ^ Colin Mackerras、Donald H. McMillen和Andrew Watson. Dictionary of the Politics of the People's Republic of China. 英國倫敦: 羅德里奇. 2001年1月27日: 第85頁 [2015年6月1日]. ISBN 978-0415250672 （英语）. ^ 附录：扩大的中央第六次全会关于各级党部工作规则与纪律的决定. 中國共產黨新聞網. 1938年11月6日 [2015年6月1日]. （原始内容存档于2014-11-03） （中文（简体）‎）. ^ H. Lyman Miller. Hu Jintao and the Party Politburo (PDF). China Leadership Monitor. 2009年11月19日 [2015年6月1日]. （原始内容存档 (PDF)于2015-11-18） （英语）. ^ 谷玥. 中国共产党第六届中央委员会历次全体会议. 新華網. [2015年6月1日]. （原始内容存档于2013年5月18日） （中文（简体）‎）. ^ 谷玥. 中共第十一届历次中央全会. 新華網. [2015年6月1日]. （原始内容存档于2013年6月27日） （中文（简体）‎）. ^ 谷玥. 中国共产党第十二届中央委员会历次全体会议. 新華網. [2015年6月1日]. （原始内容存档于2013年2月7日） （中文（简体）‎）. ^ 李成（英语：Cheng Li）. Intra-Party Democracy in China: Should We Take It Seriously? (PDF). China Leadership Monitor. 2009年11月19日 [2015年6月1日]. （原始内容存档 (PDF)于2015-11-18） （英语）. ^ William A. Joseph. Politics in China: An Introduction. 英國牛津: 牛津大學出版社. 2010年4月23日: 第169頁 [2015年6月1日]. ISBN 978-0195335309 （英语）. ^ 新華社. General Secretary of CPC Central Committee. 中國國際廣播電台. 2012年11月13日 [2015年6月1日]. （原始内容存档于2016-02-16） （英语）. ^ Jeremy Page. China's President Takes Bigger Security Role. 《華爾街日報》. 2014年1月24日 [2015年6月1日]. （原始内容存档于2015-10-06） （英语）. ^ 124.0 124.1 124.2 Colin Mackerras、Donald H. McMillen和Andrew Watson. Dictionary of the Politics of the People's Republic of China. 英國倫敦: 羅德里奇. 2001年1月27日: 第74頁 [2015年6月1日]. ISBN 978-0415250672 （英语）. ^ Zhengyuan Fu. Autocratic Tradition and Chinese Politics. 英國劍橋: 劍橋大學出版社. 1994年1月28日: 第201頁 [2015年6月1日]. ISBN 978-0521442282 （英语）. ^ Lawrence R. Sullivan. Historical Dictionary of the Chinese Communist Party. 美國拉納姆: 羅曼和利特爾菲爾德出版集團公司（英语：Rowman & Littlefield）. 2011年11月4日: 第212頁 [2015年6月1日]. ISBN 978-0810872257 （英语）. ^ 理查德·麥格雷戈（英语：Richard McGregor）. The party organiser. 《金融時報》. 2009年9月30日 [2015年6月1日] （英语）. ^ 129.0 129.1 理查德·麥格雷戈（英语：Richard McGregor）. The Party: The Secret World of China's Communist Rulers. 美國紐約: 哈珀柯林斯. 2012年7月31日: 第17頁 [2015年6月1日]. ISBN 978-0061708763 （英语）. ^ Sujian Guo. Chinese Politics and Government: Power, Ideology and Organization. 英國倫敦: 羅德里奇. 2012年9月12日: 第123頁 [2015年6月1日]. ISBN 978-0415551380 （英语）. ^ 131.0 131.1 I. C. Smith和Nigel West. Historical Dictionary of Chinese Intelligence. 美國拉納姆: 羅曼和利特爾菲爾德出版集團公司（英语：Rowman & Littlefield）. 2012年5月14日: 第127頁 [2015年6月1日]. ISBN 978-0810871748 （英语）. ^ 133.0 133.1 Lawrence R. Sullivan. Historical Dictionary of the Chinese Communist Party. 美國拉納姆: 羅曼和利特爾菲爾德出版集團公司（英语：Rowman & Littlefield）. 2011年11月4日: 第49頁 [2015年6月1日]. ISBN 978-0810872257 （英语）. ^ David Ian Chambers. Edging in From the Cold: The Past and Present State of Chinese Intelligence Historiography. 中央情報局. 2012年10月17日 [2015年6月1日]. （原始内容存档于2015-06-09） （英语）. ^ 俞可平. Democracy and the Rule of Law in China. 荷蘭萊登: 布裏爾出版社（英语：Brill Publishers）. 2010年5月20日: 第8頁 [2015年6月1日]. ISBN 978-9004182127 （英语）. ^ Kevin Latham. Pop Culture China! : Media, Arts, and Lifestyle. 美國聖塔芭芭拉: ABC-CLIO（英语：ABC-CLIO）. 2007年7月27日: 第124頁 [2015年6月1日]. ISBN 978-1851095827 （英语）. ^ Timothy R. Heath. China's New Governing Party Paradigm: Political Renewal and the Pursuit of National Rejuvenation. 英國法納姆: Ashgate Publishing（英语：Ashgate Publishing）. 2014年12月23日: 第141頁 [2015年6月1日]. ISBN 978-1409462019 （英语）. ^ 英國廣播公司. China media: Third Plenum. BBC新聞網. 2013年11月13日 [2015年6月1日]. （原始内容存档于2014-02-24） （英语）. ^ 中国共产党中央委员会. 中国共产党地方委员会工作条例（试行）. 中国共产党新闻网. 1996年4月5日 [2015年6月1日] （中文（简体）‎）. ^ 王为衡. 中国共产党入党誓词的沿革. 中國共產黨新聞網. 2011年7月20日 [2015年6月1日]. （原始内容存档于2016-03-04） （中文（简体）‎）. ^ 143.0 143.1 143.2 143.3 143.4 143.5 143.6 143.7 Lawrence R. Sullivan. Historical Dictionary of the Chinese Communist Party. 美國拉納姆: 羅曼和利特爾菲爾德出版集團公司（英语：Rowman & Littlefield）. 2011年11月4日: 第183頁 [2015年6月1日]. ISBN 978-0810872257 （英语）. ^ “外籍党员”：中共党史上的一个特殊群体. 《北京日报》. 2014年10月27日 [2014年10月27日]. （原始内容存档于2016年8月22日） （中文（简体）‎）. ^ 程宏毅和常雪梅. 发展党员调控效果明显：党员8668.6万名，总量增速放缓. 中國共產黨新聞網. 2014年7月1日 [2015年6月1日]. （原始内容存档于2015-06-15） （中文（简体）‎）. ^ 印度人民党党员破亿“成为全球最大政党”. 新华网. 2015-04-22 [2018-05-03]. （原始内容存档于2018-05-04）. ^ 147.0 147.1 147.2 Lawrence R. Sullivan. Historical Dictionary of the People's Republic of China. 美國拉納姆: 羅曼和利特爾菲爾德出版集團公司（英语：Rowman & Littlefield）. 2007年5月23日: 第582頁 [2015年6月1日]. ISBN 978-0810864436 （英语）. ^ Lawrence R. Sullivan. Historical Dictionary of the People's Republic of China. 美國拉納姆: 羅曼和利特爾菲爾德出版集團公司（英语：Rowman & Littlefield）. 2007年5月23日: 第583頁 [2015年6月1日]. ISBN 978-0810864436 （英语）. ^ Lu Hui. Communist Youth League convenes national congress. 新華網. 2013年6月17日 [2015年6月1日]. （原始内容存档于2016-03-10） （英语）. ^ 151.0 151.1 151.2 151.3 中国共产党思想理论基础. 中共中央對外聯絡部. [2015年6月1日]. （原始内容存档于2006年4月19日） （中文（简体）‎）. ^ Zhu Ningzhu. Mao Zedong Thought. 新華網. 2013年12月26日 [2015年6月1日]. （原始内容存档于2016-03-04） （英语）. ^ Adrian Chan. Chinese Marxism. 英國倫敦: 布鲁姆斯伯里出版社（英语：Bloomsbury Publishing）. 2003年6月29日: 第180頁 [2015年6月1日]. ISBN 978-0826473073 （英语）. ^ Adrian Chan. Chinese Marxism. 英國倫敦: 布鲁姆斯伯里出版社（英语：Bloomsbury Publishing）. 2003年6月29日: 第201頁 [2015年6月1日]. ISBN 978-0826473073 （英语）. ^ 羅伯特·勞倫斯·庫恩（英语：Robert Lawrence Kuhn）. How China's Leaders Think: The Inside Story of China's Past, Current and Future Leaders. 美國霍博肯: 約翰威立. 2011年6月15日: 第108頁至第109頁 [2015年6月1日]. ISBN 978-1118085905 （英语）. ^ 羅伯特·勞倫斯·庫恩（英语：Robert Lawrence Kuhn）. How China's Leaders Think: The Inside Story of China's Past, Current and Future Leaders. 美國霍博肯: 約翰威立. 2011年6月15日: 第107頁至第108頁 [2015年6月1日]. ISBN 978-1118085905 （英语）. ^ 羅伯特·勞倫斯·庫恩（英语：Robert Lawrence Kuhn）. How China's Leaders Think: The Inside Story of China's Past, Current and Future Leaders. 美國霍博肯: 約翰威立. 2011年6月15日: 第110頁 [2015年6月1日]. ISBN 978-1118085905 （英语）. ^ Misa Izuhara. Handbook on East Asian Social Policy. 英國卓特咸: 愛德華·埃爾加出版社（英语：Edward Elgar Publishing）. 2014年5月14日: 第110頁 [2015年6月1日]. ISBN 978-0857930293 （英语）. ^ Sujian Guo和Baogang Guo. China in Search of a Harmonious Society. 美國拉納姆: 羅曼和利特爾菲爾德出版集團公司（英语：Rowman & Littlefield）. 2008年8月15日: 第119頁 [2015年6月1日]. ISBN 978-0739126240 （英语）. ^ Sujian Guo和Baogang Guo. China in Search of a Harmonious Society. 美國拉納姆: 羅曼和利特爾菲爾德出版集團公司（英语：Rowman & Littlefield）. 2008年8月15日: 第121頁 [2015年6月1日]. ISBN 978-0739126240 （英语）. ^ 储百亮. 习近平思想被写入党章，崇高地位比肩毛泽东. 纽约时报中文网. 2017年10月25日 [2017年12月24日]. （原始内容存档于2017-12-24）. ^ 刘云山. 深入学习贯彻习近平新时代中国特色社会主义思想. 人民日报. 2017年11月6日 [2017年12月24日]. （原始内容存档于2017-12-24）. ^ 习近平. 决胜全面建成小康社会 夺取新时代中国特色社会主义伟大胜利. 新华网. 2017年10月18日 [2018年4月25日]. （原始内容存档于2018-04-20）. ^ Chris Buckley. Xi Touts Communist Party as Defender of Confucius’s Virtues. 《紐約時報》. 2014年2月13日 [2015年6月1日]. （原始内容存档于2014-02-22） （英语）. ^ 167.0 167.1 167.2 167.3 Marketization the key to economic system reform. 《中國日報》. 2013年11月18日 [2015年6月1日]. （原始内容存档于2015-09-24） （英语）. ^ 168.0 168.1 168.2 Michael Heazle和Nick Knight. China-Japan Relations in the Twenty-first Century: Creating a Future Past?. 英國卓特咸: 愛德華·埃爾加出版社（英语：Edward Elgar Publishing）. 2007年10月31日: 第62頁 [2015年6月1日]. ISBN 978-1847201126 （英语）. ^ 169.0 169.1 169.2 169.3 Michael Heazle和Nick Knight. China-Japan Relations in the Twenty-first Century: Creating a Future Past?. 英國卓特咸: 愛德華·埃爾加出版社（英语：Edward Elgar Publishing）. 2007年10月31日: 第63頁 [2015年6月1日]. ISBN 978-1847201126 （英语）. ^ Michael Heazle和Nick Knight. China-Japan Relations in the Twenty-first Century: Creating a Future Past?. 英國卓特咸: 愛德華·埃爾加出版社（英语：Edward Elgar Publishing）. 2007年10月31日: 第64頁 [2015年6月1日]. ISBN 978-1847201126 （英语）. ^ 羅伯特·勞倫斯·庫恩（英语：Robert Lawrence Kuhn）. How China's Leaders Think: The Inside Story of China's Past, Current and Future Leaders. 美國霍博肯: 約翰威立. 2011年6月15日: 第369頁 [2015年6月1日]. ISBN 978-1118085905 （英语）. ^ 沈大偉. China's Communist Party: Atrophy and Adaptation. 美國奧克蘭: 加利福尼亞大學出版社. 2008年4月2日: 第104頁 [2015年6月1日]. ISBN 978-0520254923 （英语）. ^ 173.0 173.1 羅伯特·勞倫斯·庫恩（英语：Robert Lawrence Kuhn）. How China's Leaders Think: The Inside Story of China's Past, Current and Future Leaders. 美國霍博肯: 約翰威立. 2011年6月15日: 第99頁 [2015年6月1日]. ISBN 978-1118085905 （英语）. ^ 174.0 174.1 174.2 174.3 174.4 羅伯特·勞倫斯·庫恩（英语：Robert Lawrence Kuhn）. How China's Leaders Think: The Inside Story of China's Past, Current and Future Leaders. 美國霍博肯: 約翰威立. 2011年6月15日: 第527頁 [2015年6月1日]. ISBN 978-1118085905 （英语）. ^ 175.0 175.1 175.2 175.3 Kerry Brown. The Communist Party of China and Ideology (PDF). An International Journal. 2012年8月2日 [2015年6月1日]. （原始内容存档 (PDF)于2014-09-12） （英语）. ^ 176.0 176.1 176.2 沈大偉. China's Communist Party: Atrophy and Adaptation. 美國奧克蘭: 加利福尼亞大學出版社. 2008年4月2日: 第105頁 [2015年6月1日]. ISBN 978-0520254923 （英语）. ^ 15 IMCWP, List of participants. 共產黨和工人黨國際會議. 2013年11月11日 [2015年6月1日]. （原始内容存档于2013-12-24） （英语）. ^ 178.0 178.1 Senior CPC official meets Portuguese Communist Party delegation. 中國共產黨新聞網. 2008年5月7日 [2015年6月1日]. （原始内容存档于2016-02-05） （英语）. ^ 179.0 179.1 新華社. Senior CPC official vows to develop friendly cooperation with French Communist Party. 人民網. 2011年12月8日 [2015年6月1日]. （原始内容存档于2016-02-02） （英语）. ^ 新華社. Chinese president meets Russian Communist Party delegation. 《中國日報》. 2014年9月26日 [2015年6月1日]. （原始内容存档于2015-07-25） （英语）. ^ 沈大偉. China's Communist Party: Atrophy and Adaptation. 美國奧克蘭: 加利福尼亞大學出版社. 2008年4月2日: 第100頁 [2015年6月1日]. ISBN 978-0520254923 （英语）. ^ 新華社. Senior CPC official meets Russian delegation. 人民網. 2012年8月24日 [2015年6月1日]. （原始内容存档于2016-02-02） （英语）. ^ CPC to institutionalize talks with European parties. 人民網. 2011年5月19日 [2015年6月1日]. （原始内容存档于2016-02-02） （英语）. ^ 新華社. Senior CPC leader meets chairman of Communist Party of Brazil. 人民網. 2005年7月5日 [2015年6月1日]. （原始内容存档于2016-02-02） （英语）. ^ A Leadership Delegation of The Communist Party of Nepal (unified Marxism-Leninism) and The United Communist Party of Nepal Visited CELAJ. 中國井岡山幹部學院. 2011年6月26日 [2015年6月1日] （英语）. ^ 黄硕. CPC leader pledges exchanges with Communist Party of Spain. 人民網. 2010年4月6日 [2015年6月1日]. （原始内容存档于2016-02-02） （英语）. ^ 12th CPA Congress. 澳大利亞共產黨. [2015年6月1日]. （原始内容存档于2015-03-29） （英语）. ^ 外国友好政党和政党组织祝贺中国共产党十七大召开. 新華網. 2007年10月15日 [2015年6月1日]. （原始内容存档于2013-09-21） （中文（简体）‎）. ^ More foreign party leaders congratulate CPC on National Congress. 新華網. 2007年10月16日 [2015年6月1日]. （原始内容存档于2014-01-08） （英语）. ^ 沈大偉. China's Communist Party: Atrophy and Adaptation. 美國奧克蘭: 加利福尼亞大學出版社. 2008年4月2日: 第81頁 [2015年6月1日]. ISBN 978-0520254923 （英语）. ^ 191.0 191.1 191.2 191.3 沈大偉. China's Communist Party: Atrophy and Adaptation. 美國奧克蘭: 加利福尼亞大學出版社. 2008年4月2日: 第82頁 [2015年6月1日]. ISBN 978-0520254923 （英语）. ^ 192.0 192.1 192.2 192.3 192.4 沈大偉. China's Communist Party: Atrophy and Adaptation. 美國奧克蘭: 加利福尼亞大學出版社. 2008年4月2日: 第84頁 [2015年6月1日]. ISBN 978-0520254923 （英语）. ^ 193.0 193.1 沈大偉. China's Communist Party: Atrophy and Adaptation. 美國奧克蘭: 加利福尼亞大學出版社. 2008年4月2日: 第85頁 [2015年6月1日]. ISBN 978-0520254923 （英语）. ^ 沈大偉. China's Communist Party: Atrophy and Adaptation. 美國奧克蘭: 加利福尼亞大學出版社. 2008年4月2日: 第85頁至第86頁 [2015年6月1日]. ISBN 978-0520254923 （英语）. ^ 沈大偉. China's Communist Party: Atrophy and Adaptation. 美國奧克蘭: 加利福尼亞大學出版社. 2008年4月2日: 第86頁至第92頁 [2015年6月1日]. ISBN 978-0520254923 （英语）. ^ 196.0 196.1 196.2 沈大偉. China's Communist Party: Atrophy and Adaptation. 美國奧克蘭: 加利福尼亞大學出版社. 2008年4月2日: 第93頁 [2015年6月1日]. ISBN 978-0520254923 （英语）. ^ 沈大偉. China's Communist Party: Atrophy and Adaptation. 美國奧克蘭: 加利福尼亞大學出版社. 2008年4月2日: 第94頁 [2015年6月1日]. ISBN 978-0520254923 （英语）. ^ 沈大偉. China's Communist Party: Atrophy and Adaptation. 美國奧克蘭: 加利福尼亞大學出版社. 2008年4月2日: 第95頁至第96頁 [2015年6月1日]. ISBN 978-0520254923 （英语）. ^ 199.0 199.1 199.2 沈大偉. China's Communist Party: Atrophy and Adaptation. 美國奧克蘭: 加利福尼亞大學出版社. 2008年4月2日: 第96頁 [2015年6月1日]. ISBN 978-0520254923 （英语）. ^ 200.0 200.1 200.2 200.3 200.4 200.5 沈大偉. China's Communist Party: Atrophy and Adaptation. 美國奧克蘭: 加利福尼亞大學出版社. 2008年4月2日: 第97頁 [2015年6月1日]. ISBN 978-0520254923 （英语）. ^ 201.0 201.1 201.2 201.3 201.4 201.5 201.6 201.7 沈大偉. China's Communist Party: Atrophy and Adaptation. 美國奧克蘭: 加利福尼亞大學出版社. 2008年4月2日: 第98頁 [2015年6月1日]. ISBN 978-0520254923 （英语）. ^ Chinese Communist Party to train chavista leaders. 《宇宙報（英语：El Universal (Caracas)）》. 2013年5月13日 [2015年6月1日]. （原始内容存档于2016-09-16） （英语）. ^ 203.0 203.1 203.2 沈大偉. China's Communist Party: Atrophy and Adaptation. 美國奧克蘭: 加利福尼亞大學出版社. 2008年4月2日: 第99頁 [2015年6月1日]. ISBN 978-0520254923 （英语）. ^ 沈大偉. China's Communist Party: Atrophy and Adaptation. 美國奧克蘭: 加利福尼亞大學出版社. 2008年4月2日: 第99頁至第100頁 [2015年6月1日]. ISBN 978-0520254923 （英语）. ^ 沈大偉. China's Communist Party: Atrophy and Adaptation. 美國奧克蘭: 加利福尼亞大學出版社. 2008年4月2日: 第82頁至第83頁 [2015年6月1日]. ISBN 978-0520254923 （英语）. ^ 206.0 206.1 206.2 206.3 沈大偉. China's Communist Party: Atrophy and Adaptation. 美國奧克蘭: 加利福尼亞大學出版社. 2008年4月2日: 第83頁 [2015年6月1日]. ISBN 978-0520254923 （英语）. ^ 張瑞楨. 〈中部〉走過威權年代 笑看反共標語. 《自由時報》. 2005年8月1日 [2015年6月1日]. （原始内容存档于2014-10-08） （中文（繁體）‎）. ^ 李筱峰. 蔣政權「反共抗俄」的政治迷思史料舉隅. 吳三連台灣史料基金會. [2015年6月1日]. （原始内容存档于2016-03-07） （中文（繁體）‎）. ^ 安同. “立委”选举后 谈台湾民众的“拒中”思维. 《聯合早報》. 2008年1月17日 [2015年6月1日]. （原始内容存档于2016-04-14） （中文（简体）‎）. ^ 谢韬. 谢韬：民主社会主义模式与中国前途. 中国改革论坛. 2012年4月19日 [2015年6月1日]. （原始内容存档于2016-03-05） （中文（简体）‎）. ^ 5. Report for Selected Countries and Subjects. 國際貨幣基金組織. 2011年9月 [2015年6月1日]. （原始内容存档于2015-03-21） （英语）. ^ 中央情報局. The World Factbook. 《世界概況》. 2014年 [2015年6月1日]. （原始内容存档于2014-05-22） （英语）. ^ 劉宇凡. 資本主義新中國的前世與今生──從中國「和平崛起」論談起. 工人民主協會. [2015年6月1日]. （原始内容存档于2015年6月2日） （中文（繁體）‎）. ^ Tim Luard. Paying the price for China's growth. BBC新聞網. 2004年10月14日 [2015年6月1日]. （原始内容存档于2008-07-26） （英语）. ^ 《環球時報》. 日媒：中国公众对中央政府的满意度极高. 鳳凰網. 2013年6月17日 [2015年6月1日]. （原始内容存档于2015-07-24） （中文（简体）‎）. ^ 王乃水. 上海自贸区一周年：亮点频现 承载海内外更高期待. 新華網. 2014年9月29日 [2015年6月1日]. （原始内容存档于2014-10-08） （中文（简体）‎）. ^ 王翠莲. 中国共产党第十八届中央委员会历次全体会议（中共中央全会）. 新華網. [2015年6月1日]. （原始内容存档于2015年6月27日） （中文（简体）‎）. ^ 《新聞聯播》. 海外媒体积极评价十八届三中全会. 中國網絡電視台. 2013年11月14日 [2015年6月1日]. （原始内容存档于2016-02-22） （中文（简体）‎）. ^ David Barboza. China’s Mr. Wu Keeps Talking. 《紐約時報》. 2009年9月26日 [2015年6月1日]. （原始内容存档于2018-12-25） （英语）. ^ 孟娜. 中共一年開除兩萬余名違紀黨員 佔總數1.7‰. 人民網. 2006年2月13日 [2015年6月1日]. （原始内容存档于2016-03-04） （中文（简体）‎）. ^ 姜洁. 国家预防腐败局揭牌. 中國共產黨新聞網. 2007年9月14日 [2015年6月1日]. （原始内容存档于2016-03-04） （中文（简体）‎）. ^ 任建明：总书记强调把反腐工作成效看作取信于民的重要指标. 中國共產黨新聞網. 2008年1月16日 [2015年6月1日]. （原始内容存档于2016-02-15） （中文（简体）‎）. ^ 《中國日報》. 外媒：四大理由证明习近平是严肃认真改革者. 騰訊. 2014年9月22日 [2015年6月1日]. （原始内容存档于2014-09-22） （中文（简体）‎）. ^ 王一. “透明国际”：中国清廉指数连续三年上升. 《環球時報》. 2013年12月4日 [2015年6月1日]. （原始内容存档于2014-10-07） （中文（简体）‎）. ^ 任琛. “大国形象”与难堪的腐败排名. 德國之聲. 2013年12月3日 [2015年6月1日]. （原始内容存档于2015-06-15） （中文（简体）‎）. ^ 屠丽美. 中国“清廉指数”如何被评低：数据无任何民意调查. 环球网. 2015-02-26 [2015-06-14]. （原始内容存档于2015-05-23） （中文（简体）‎）. ^ 外交部回应“中国2014年清廉指数排名下降”. 人民网. 2014-12-04 [2015-06-14]. （原始内容存档于2015-06-16） （中文（简体）‎）. ^ 黄芳. 《学习时报》时评：信息公开彰显自信中国形象. 搜狐. 2008年6月16日 [2015年6月1日]. （原始内容存档于2016-03-04） （中文（简体）‎）. ^ 新華網. 国外媒体高度评价中国共产党救灾行动. 新浪. 2008年5月30日 [2015年6月1日]. （原始内容存档于2014-12-26） （中文（简体）‎）. ^ 李大同. 争论中闭幕的北京奥运. BBC新聞網. 2008年8月25日 [2015年6月1日]. （原始内容存档于2014-12-26） （中文（简体）‎）. ^ 232.0 232.1 景玥. 中央强调突发事件信息传播抢先机. 中國共產黨新聞網. 2008年7月25日 [2015年6月1日]. （原始内容存档于2016-03-04） （中文（简体）‎）. ^ PRESS FREEDOM INDEX 2011-2012. 無國界記者. [2015年6月1日]. （原始内容存档于2016年3月3日） （英语）. ^ 全球民主指數 台灣亞洲第3. 中央通訊社. 2013年3月20日 [2015年6月1日]. （原始内容存档于2015-09-24） （中文（繁體）‎）. ^ Democracy Index 2012: Democracy is at a standstill. 《經濟學人》. [2015年6月1日]. （原始内容存档于2015-06-03） （英语）. ^ 陳志芬. 兩會觀察：中國軍費和「維穩」開支. BBC新聞網. 2014年3月5日 [2015年6月1日]. （原始内容存档于2014-10-02） （中文（繁體）‎）. ^ 黃安偉. 中國政府避談地方維穩預算增長. 《紐約時報》. 2014年3月7日 [2015年6月1日]. （原始内容存档于2014-10-06） （中文（繁體）‎）. （英文） A·詹姆斯·格雷戈爾（英语：A. James Gregor）. Marxism, China, and Development: Reflections on Theory and Reality. 美國皮斯卡特維: 交易出版社（英语：Transaction Publishers）. 1999年7月1日. ISBN 978-0765806345. （英文） 卜睿哲. Untying the Knot: Making Peace in the Taiwan Strait. 美國華盛頓: 布魯金斯學會. 2005年11月1日. ISBN 978-0815797814. （英文） 包瑞嘉（英语：Richard Baum）. Burying Mao. 美國普林斯頓: 普林斯頓大學出版社. 1996年1月28日. ISBN 978-0691036373. （英文） 馬塞羅·默斯托（英语：Marcello Musto）. Karl Marx's Grundrisse: Foundations of the critique of political economy 150 years later. 英國倫敦: 羅德里奇. 2008年7月25日. ISBN 978-1134073825. （英文） 方德萬. From Friend to Comrade: The Founding of the Chinese Communist Party, 1920-1927. 美國奧克蘭: 加利福尼亞大學出版社. 1992年2月26日. ISBN 978-0520072718. （英文） 傅高義. Deng Xiaoping and the Transformation of China. 美國劍橋: 哈佛大學出版社. 2011年9月26日. ISBN 978-0674055445. （英文） 理查德·麥格雷戈（英语：Richard McGregor）. The Party: The Secret World of China's Communist Rulers. 美國紐約: 哈珀柯林斯. 2012年7月31日. ISBN 978-0061708763. （英文） 李成（英语：Cheng Li）. China's Changing Political Landscape: Prospects for Democracy. 美國華盛頓: 布魯金斯學會. 2008年4月1日. ISBN 978-0815752097. （英文） 利·费贡（英语：Lee Feigon）. 《毛澤東：再解讀（英语：Mao: A Reinterpretation）》（Mao: A Reinterpretation）. 美國拉納姆: 羅曼和利特爾菲爾德出版集團公司（英语：Rowman & Littlefield）. 2003年7月24日. ISBN 978-1566635226. （英文） 羅伯特·勞倫斯·庫恩（英语：Robert Lawrence Kuhn）. How China's Leaders Think: The Inside Story of China's Past, Current and Future Leaders. 美國霍博肯: 約翰威立. 2011年6月15日. ISBN 978-1118085905. （英文） 乔纳森·安格（英语：Jonathan Unger）. The Nature of Chinese Politics: From Mao to Jiang. 美國阿蒙克: M·E·夏普出版公司（英语：M. E. Sharpe）. 2002年6月. ISBN 978-0765608482. （英文） 趙穗生. A Nation-State by Construction: Dynamics of Modern Chinese Nationalism. 美國紅木城: 史丹福大學出版社. 2004年9月8日. ISBN 978-0804750011. （英文） 鄭永年. The Chinese Communist Party in Reform. 英國倫敦: 羅德里奇. 2006年4月18日. ISBN 978-1134188970. （英文） 沈大偉. China's Communist Party: Atrophy and Adaptation. 美國奧克蘭: 加利福尼亞大學出版社. 2008年4月2日. ISBN 978-0520254923. （英文） 沈大偉. China Goes Global: The Partial Power. 英國牛津: 牛津大學出版社. 2014年8月1日. ISBN 978-0199361038. （英文） 斯圖爾特·施拉姆. Mao Tse-tung. 英國西敏市: 企鵝出版集團. 1967年1月30日. ISBN 978-0140208405. （英文） 王賡武. China: Development and Governance. 新加坡: 世界出版社（英语：World Scientific）. 2012年12月21日. ISBN 978-9814425834. （英文） 俞可平. Democracy and the Rule of Law in China. 荷蘭萊登: 布裏爾出版社（英语：Brill Publishers）. 2010年5月20日. ISBN 978-9004182127. （英文） Adrian Chan. Chinese Marxism. 英國倫敦: 布鲁姆斯伯里出版社（英语：Bloomsbury Publishing）. 2003年6月29日. ISBN 978-0826473073. （英文） Catherine Jones Finer. Social Policy Reform in China: Views from Home and Abroad. 英國法納姆: Ashgate Publishing（英语：Ashgate Publishing）. 2003年8月. ISBN 978-0754631750. （英文） Chris Ogden. Handbook of China's Governance and Domestic Politics. 英國倫敦: 羅德里奇. 2012年12月6日. ISBN 978-1857436365. （英文） Colin Mackerras、Donald H. McMillen和Andrew Watson. Dictionary of the Politics of the People's Republic of China. 英國倫敦: 羅德里奇. 2001年1月27日. ISBN 978-0415250672. （英文） Edwin Leung. Historical Dictionary of Revolutionary China, 1839-1976. 美國聖塔芭芭拉: 格林伍德出版集團（英语：Greenwood Publishing Group）. 1992年3月17日. ISBN 978-0313264573. （英文） Guoli Liu. Politics and Government in China. 美國聖塔芭芭拉: ABC-CLIO（英语：ABC-CLIO）. 2011年7月22日. ISBN 978-0313357305. （英文） I. C. Smith和Nigel West. Historical Dictionary of Chinese Intelligence. 美國拉納姆: 羅曼和利特爾菲爾德出版集團公司（英语：Rowman & Littlefield）. 2012年5月14日. ISBN 978-0810871748. （英文） James Z. Gao. Historical Dictionary of Modern China (1800-1949). 美國拉納姆: 羅曼和利特爾菲爾德出版集團公司（英语：Rowman & Littlefield）. 2009年6月16日. ISBN 978-0810849303. （英文） Judith F. Kornberg和John R. Faust. China in World Politics: Policies, Processes, Prospects. 美國波德: Lynne Rienner Publishers（英语：Lynne Rienner Publishers）. 2005年3月30日. ISBN 978-1588262486. （英文） Kevin Latham. Pop Culture China! : Media, Arts, and Lifestyle. 美國聖塔芭芭拉: ABC-CLIO（英语：ABC-CLIO）. 2007年7月27日. ISBN 978-1851095827. （英文） Kwok-sing Li. A Glossary of Political Terms of the People's Republic of China. 中國香港: 中文大學出版社. 1995年1月6日. ISBN 978-9622016156. （英文） Lawrence R. Sullivan. Historical Dictionary of the People's Republic of China. 美國拉納姆: 羅曼和利特爾菲爾德出版集團公司（英语：Rowman & Littlefield）. 2007年5月23日. ISBN 978-0810864436. （英文） Lawrence R. Sullivan. Historical Dictionary of the Chinese Communist Party. 美國拉納姆: 羅曼和利特爾菲爾德出版集團公司（英语：Rowman & Littlefield）. 2011年11月4日. ISBN 978-0810872257. （英文） Michael Heazle和Nick Knight. China-Japan Relations in the Twenty-first Century: Creating a Future Past?. 英國卓特咸: 愛德華·埃爾加出版社（英语：Edward Elgar Publishing）. 2007年10月31日. ISBN 978-1847201126. （英文） Misa Izuhara. Handbook on East Asian Social Policy. 英國卓特咸: 愛德華·埃爾加出版社（英语：Edward Elgar Publishing）. 2014年5月14日. ISBN 978-0857930293. （英文） Peter Carter. Mao. 英國牛津: 牛津大學出版社. 1976年11月18日. ISBN 978-0192731401. （英文） Ronald Coase和Ning Wang. How China Became Capitalist. 英國倫敦: 帕爾格雷夫·麥克米蘭. 2012年4月15日. ISBN 978-0826473073. （英文） Stephen White. Russia's New Politics: The Management of a Postcommunist Society. 英國劍橋: 劍橋大學出版社. 1999年11月28日. ISBN 978-0521587372. （英文） Sujian Guo. Chinese Politics and Government: Power, Ideology and Organization. 英國倫敦: 羅德里奇. 2012年9月12日. ISBN 978-0415551380. （英文） Sujian Guo和Baogang Guo. China in Search of a Harmonious Society. 美國拉納姆: 羅曼和利特爾菲爾德出版集團公司（英语：Rowman & Littlefield）. 2008年8月15日. ISBN 978-0739126240. （英文） Timothy R. Heath. China's New Governing Party Paradigm: Political Renewal and the Pursuit of National Rejuvenation. 英國法納姆: Ashgate Publishing（英语：Ashgate Publishing）. 2014年12月23日. ISBN 978-1409462019. （英文） Thomas A. Baylis. Governing by Committee: Collegial Leadership in Advanced Societies. 美國奧巴尼: 紐約州立大學出版社（英语：State University of New York Press）. 1989年6月. ISBN 978-0887069444. （英文） Tony Saich和Benjamin Yang. The Rise to Power of the Chinese Communist Party: Documents and Analysis. 美國阿蒙克: M·E·夏普出版公司（英语：M. E. Sharpe）. 1996年12月. ISBN 978-1563241550. （英文） Wen-hsin Yeh. Provincial Passages: Culture, Space, and the Origins of Chinese Communism. 美國奧克蘭: 加利福尼亞大學出版社. 1996年1月24日. ISBN 978-0520200685. （英文） William A. Joseph. Politics in China: An Introduction. 英國牛津: 牛津大學出版社. 2010年4月23日. ISBN 978-0195335309. （英文） Wong Yiu-Chung. From Deng Xiaoping to Jiang Zemin: Two Decades of Political Reform in the People's Republic of China. 美國拉納姆: 美洲大學出版社（英语：University Press of America）. 2005年2月22日. ISBN 978-0761830740. （英文） X. L. Ding. The Decline of Communism in China: Legitimacy Crisis, 1977-1989. 英國劍橋: 劍橋大學出版社. 2006年4月27日. ISBN 978-0521026239. （英文） Zhengyuan Fu. Autocratic Tradition and Chinese Politics. 英國劍橋: 劍橋大學出版社. 1994年1月28日. ISBN 978-0521442282. （英文） China in the Global Economy: Governance in China. 經濟合作暨發展組織. 2005年9月1日. ISBN 978-9264008441.